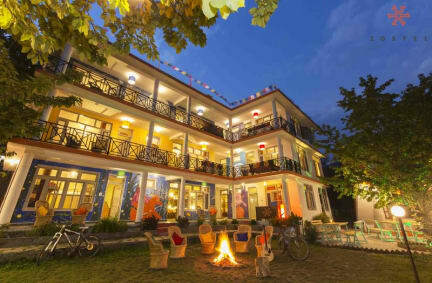 Nestled in the very scenic town of Old Manali. Zostel brings you fresh air (literally) to breathe in the essence of hills. With ice cap peaks providing you a wonderful 360 degree panaroma and age old European and Israeli cafes dotting its' neighbourhood, Zostel gets you a complete package. With specific spaces marked for travelers and explorers of all types, the property is a joy to explore and relax. Just a short walk away from the Ancient Manu Temple, the location couldn't get any better. Providing the exact mixture of cultural civilization and serenity. Luxury Private Rooms with outstanding views, Spacious Mixed and Female Dorms and of course a Garden Cafe, the property stands out on its' own. 2. Check-out Time: until 10:00am. 6. Zostel Manali is open 24-hours a day, 7-days a week so you can come and go whenever you please. 7. The price of your bed includes Wi-Fi access and your bed linen. Beware.